Amazing opportunity to purchase a large 15000m2 plot in Benissa with panoramic views of the mediterranean sea and open views of the Spanish countrysides and only a 7 minute drive to the beach and a 4 minute drive to the center of town. Very private detached villa surrounded by mature Mediterranean gardens and with a garage. The villa has a lounge with fireplace, exposed beams, fully fitted kitchen, central heating and a spacious covered terrace looking out onto the 8 x 4m swimming pool. Detached villa, walking distance to shops and restaurants. The house comprises of a large lounge with woodburner, seperate dining and equipped kitchen. 2 double bedrooms, small study and a bathroom. From the lounge and dining, french doors with direct acces to the terrace and pool area. Nice sea views from the terrace. In the underbuild, seperate guest bedroom and bathroom. Viewing advised, this villa is in a top location! Newly built villa with high quality materials, home decoration is very elegant and comfortable and very romantic. Ideal for living all year long. Detached Villa, Close to the Sea, Furnished: Negotiable, Fitted Kitchen, Parking: Carport, Pool: Private, Garden: Private, Facing: South Views: Garden, Pool. Features 5-10 minutes to Golf Course, 5-10 minutes to shops, Air Conditioning Hot/Cold, Central Heating, Covered Terrace, Detached Villa, Double Glazing, Easily maintained gardens, En suite, Excellent Condition, Fitted Kitchen, Irrigation, Large Storeroom, Living room with dining area, Living room with fireplace, Near amenities, Open Fireplace, Parking, Private pool, Private Terrace, Quiet Location, Satellite TV, Sought After Area, Telephone, Terrace, Utility Room. Villa with sea views. Reformed in 2005. Just 5 minutes from the shops and kind of amenities. Nice House with three bedrooms and a bath, swimming pool with summer kitchen and barbecue. Spacious dining room overlooking to the sea, second lounge with a fireplace, on the first floor 3 bedrooms with wardrobes. Open kitchen fully equipped, connected with utility room. Nice semi cover naya connected to the kitchen. House perfect for rental proposes. 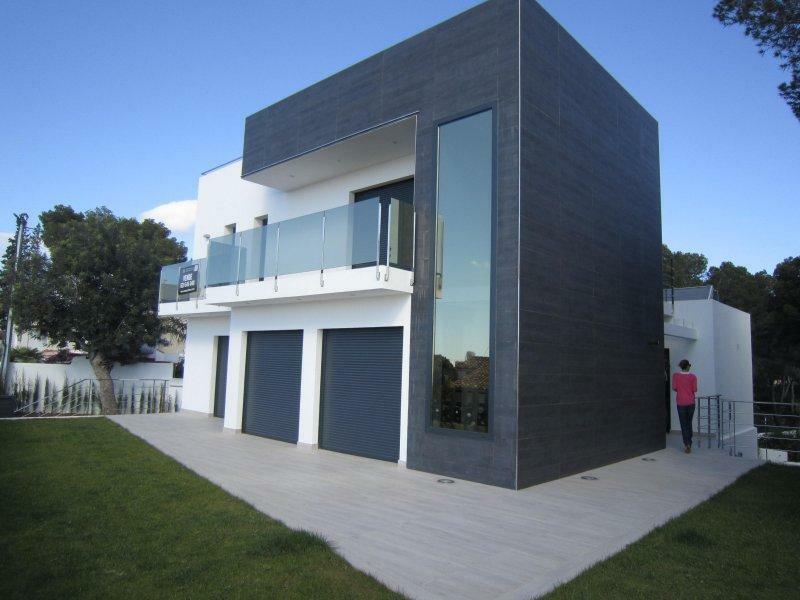 Private Villa for sale in Benissa, Costa Blanca. This beautiful villa is located on a 1,300 m2 plot, with orange trees and 3 beautiful olive trees.The villa has on the ground floor an open plan kitchen with further storage area behind that could be used to make a large kitchen, a living and dining room. From the dining room is access to a large covered, enclosed at each end. From the living room a staircase leads up to the 3 bedrooms and 3 bathrooms (two of them onsuite).2 bedrooms have direct access to a terrace. On the lower area is a studio apartment of approximately 40m2 with a kitchen and bathroom.Outside there is an 8 x 4m swimming pool, a poolside shower and BBQ. Other extras include: Oil underfloor central heating, hot and cold air conditioning in the lounge, double glazed windows, BBQ, storage room. REDUCED FOR A QUICK SALESea view villa for sale in Benissa Costa. 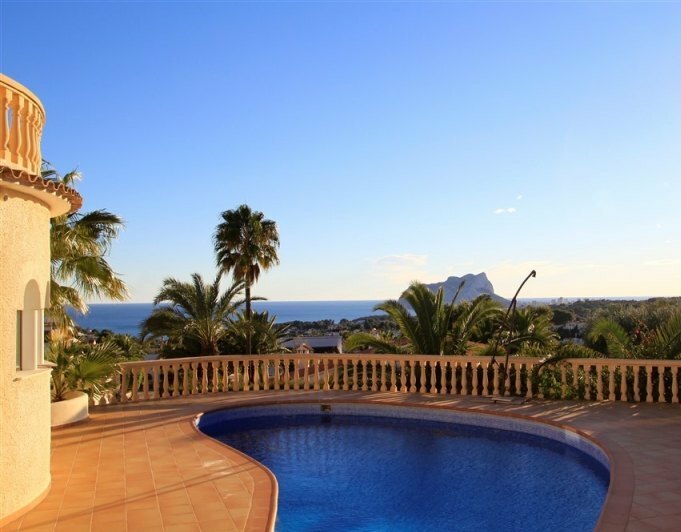 This luxury four bedroom property is located in a quiet location with stunning sea views and across to the Peñon de Ifach. The accommodation comprises of, on the upper level, three guest bedrooms both with fitted wardrobes and one with doors to a private terrace offering panoramic sea views, also on this level is a guest bathroom, Internal stairs lead down to the main living area and a large openplan lounge/diner with double sliding doors leading directly out to the terrace, which offers fabulous door sea views. Also on this level, is an openplan well fitted kitchen, a double bedroom and guest shower room.The outside areas are mainly terraced and there is a private heated 7 x 4m swimming pool.Extras include: Double glazed windows with mosquito nets and blinds, central heating, hot and cold airconditioning, oil central heating, heated swimming pool and private parking. Sea view villa for sale in Benissa Costa. Located just 400metre from the beach and amenities is this unique view villa, which enjoys fabulous views of the sea.The accommodation comprises of on the main level, an enclosed naya/diningroom with fabulous views of the sea, a large lounge with feature fireplace housing a log burner, a galleystyle kitchen, two double bedrooms and a shower room. Internal stairs lead down from one of the bedrooms to the lower level and a laundry area, bathroom and sauna. There are two further bedrooms, a bathroom, a 2nd lounge/diner and an Americanstyle kitchen. Doors lead to the outside and a summer kitchen. A few steps to down to an 8 x 4m swimming pool, BBQ area all with stunning views. Fantastic farm, reformed and cared to a detail, lovely sea views, good size garden. All on the same floor, just 5 minutes from all amenities, restaurants, supermarket, schools. Carport for two cars, swimming pool with a separate house for a possible sauna or summer kitchen. Naya covered with traditional oven. Large separate dining room with breakfast bar which leds into a very large and bright kitchen. Three bedrooms and three bathrooms, two en-suite. Separate dressing room with possibility of converting into a single bedroom. The House has a tank of water for the garden. Central heating. Original floors in good condition, ceilings with wooden beams, rooms with laminate wood floor. The ideal House for a family. Villa with indoor pool for sale in San Jaime, Benissa Costa. 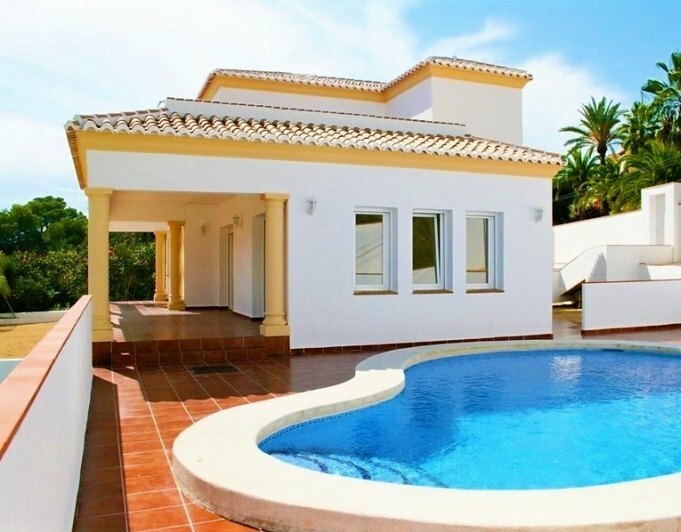 This unique villa is located in the soughtafter location of San Jaime at the end of a culde sac and is walking distance to golf and amenities. A sweeping staircase leads up to the entrance and the lower level, which comprises of a large area with indoor swimming pool, American –style kitchen, seating area and dining area, also on this level are two double bedrooms, one with ensuite bathroom, a shower room, a utility room and a games room, with access to a double garage. Internal stairs lead up to the upper level and a spacious area with a sofa bed, a very large lounge with beams and arches and a feature fireplace , doors lead out to a terrace with wonderful sea and mountain views, a dining area and openplan kitchen. There is a guest bedroom and shower room and a very large master bedroom with ensuite bathroom and door to a roof terrace offering panoramic sea and mountain views.Outside, and on the lower living area is an 8 x 4m swimming pool and terrace with sea views.Other extras include: Oil central heating, hot and cold airconditioning, solar panels for hot water, a double garage BBQ store room utility room and poolside shower. Beautiful open plan modern country house in Benissa with open mountain and sea views with complete privacy. Real opportunity and has a lot of potential! Distribution: Ground floor, large living room with fireplace, WC, spacious kitchen, master bedroom with fireplace and en suite bath, office, pantry, laundry, storage, warehouse, porche, pergola. Upstairs, two bedrooms, one with bath and one with shower en suite. Well maintained native garden, terraces, BBQ, infinity pool 10X5, alarm, central floor heating, air conditioning in bedrooms. Plot facing south and overlooking the sea and the surrounding mountains. Highly recommend viewing! New construction design detached villa with 347m2 distributed in 4 bedrooms, 4 bathrooms, toilet, spacious living room, kitchen and spa with sauna, jacuzzi, showers and patio. Plot of 1,100m2 equipped with garden, pool and parking area. Well connected, close to all amenities and 1.4km from the beach. 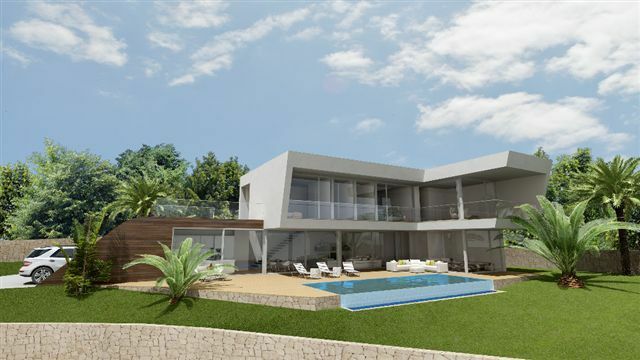 Brand new with beautiful sea and peñon modern villa.It has a separate guest apartment.automatic blinds, automatic entrance gate,two main entrances, solar panels.Located 600metres from the sea. Luxury 6 bedroom finca for sale in Benissa. 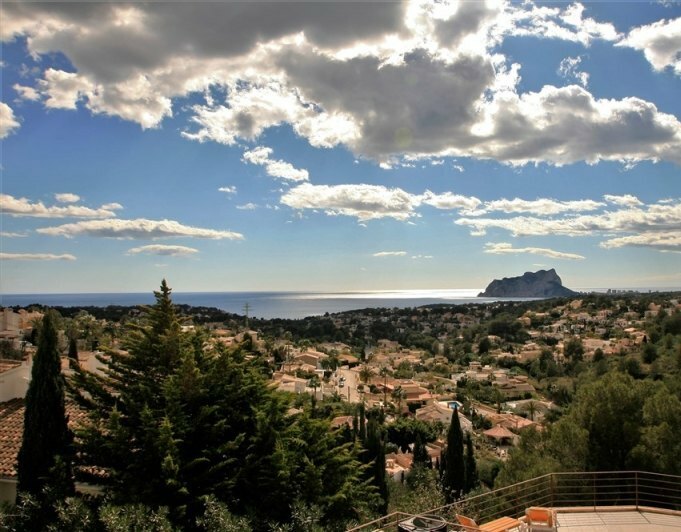 This fabulous property sits on a plot of 11.400m2 and is located between the towns of Benissa and Calpe and enjoys lovely views of the mountains and some views of the sea.The property was constructed in 2004 and has been built using the best materials. All of the exterior walls are of double block with 40cm insulation. The internal joinery is of the Brazilian wood and the windows are all double glazed set in hardwood.This two level finca comprises of 6 double bedrooms with solid wood wardrobes, 6 bathrooms with luxury Roca fittings, a luxury independent kitchen with Smeg appliances, a lounge lounge/diner, a further sitting room and an office.The house is surrounded by a breathtakingly beautiful garden of more than 5000m2 with irrigation system that draws water from its own well.Other extras include: Hot and cold Daikin air conditioning, gas central heating, satellite TV, internet, telephone, carport, BBQ and a storeroom.